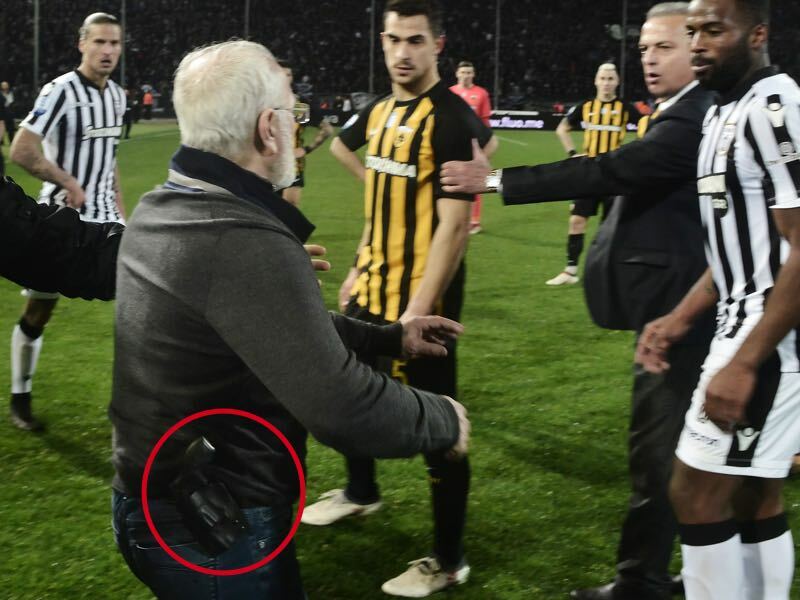 The images of PAOK owner, the Russian oligarch Ivan Savvidis, storming the field with a gun strapped to his belt towards the end of the PAOK vs AEK Athens game on the weekend went around the world and were a significant topic on the Futbolgrad Podcast. The immediate fallout of the incident has been the suspension of the Superleague Greece. The match between PAOK and AEK was labelled as a title-deciding match with AEK sitting two points ahead of PAOK in the table with PAOK having one point in hand and only six games left to play. As Thomas Farines explained to the Futbolgrad Network the match was the expected heated affair despite the fact that no away fans were allowed inside the stadium. “AEK Athens fans wouldn’t go near the stadium on a matchday, and away fans, in general, are not allowed at games,” Farines said on the Futbolgrad Podcast. Despite those measures, however, Greek football has seen a turbulent season with crowd disturbances causing cancellations and games to be played in empty stadiums. 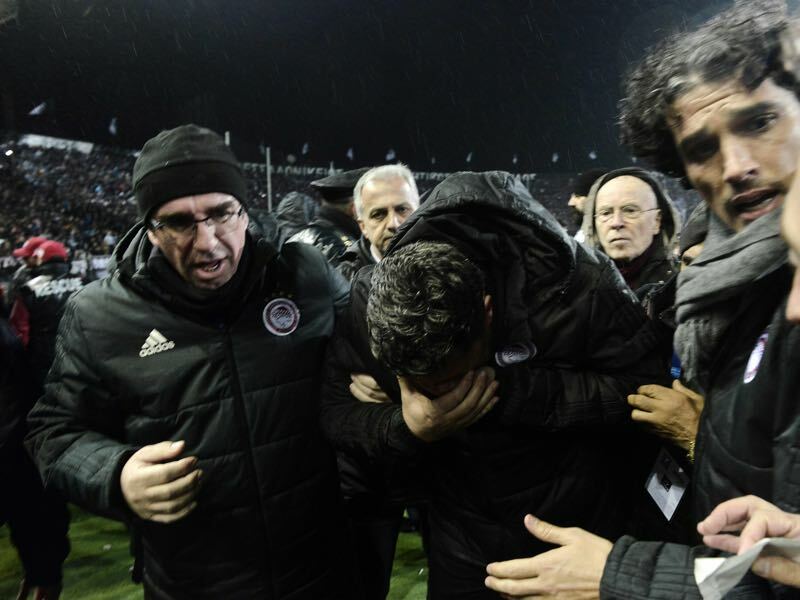 In late February the match between Olympiacos and PAOK never got underway after Olympiacos head coach Oscar Garcia was hit in the face with a cash register paper roll. Garcia was rushed to a hospital, and the teams stayed at the stadium for three hours until the game was called off. PAOK later claimed that “this is a shadow play, a strategy that Olympiacos started implementing even ahead of the game, fantasising about [incidents] in its friendly media”, PAOK’s chief of communications Kyriakos Kyriakos said. Olympiacos later released a statement by the hospital that underlined that Garcia carried away some significant injuries from the thrown paper roll. Olympiacos themselves face point deduction from crowd disturbances in January, and therefore there is a sense that the club that have dominated the competition now for seven years in a row would do everything in their power to see PAOK points deducted as well. But there is more to the story as Farines explained on the Futbolgrad Podcast. Olympiacos, owned by the shipping mogul Evangelos Marinakis, the club from Athens harbour city of Piraeus always represented the wealthy elite from the capital. In fact, clubs from the capital have dominated Greek football, and only PAOK (two championships) and Aris (three championships), both from Thessaloniki, as well as AE Larissa (one title) were able to break through the monopoly of Athens based clubs. As a result, there is some sense in Greece that the title is rigged towards the big clubs from Athens – AEK, Olympiacos and Panathinaikos. Indeed there are enough reports to suggest that the big clubs do everything in their power to keep the title in the capital and that Olympiacos, in particular, is maintaining the status quo at all costs. Breaking through that monopoly was one of the primary goals when Ivan Savvidis took over the club in 2012. PAOK FC are one of the most important clubs in Greek football, and their owner Savvidis is ranked in the top 30 of Russia’s wealthiest oligarchs by Forbes. To take over the club in 2015 the Greek government signed an agreement with the club that effectively freed PAOK from €20 million in tax debt. The tax relief for the club was signed in an emergency process by Prime Minister Alexis Tsipras, and therefore was not approved by the Greek parliament. Within this agreement the Greek government forfeited claims of €20 million which have accumulated because of interest rates on the club’s unpaid taxes, PAOK, in turn, paid €11 million in full right away. A Pontic Greek born in the Soviet village of Santa, which is now located in independent Georgia, Savvidis grew up in Rostov-na-Don, where he was also in some capacity involved with the local club FC Rostov clearing debts and aiding in paying wages without claiming direct ownership. He first earned money as a clown, and later became a worker in the Donskoi Tabak factory, where he was eventually able to take over ownership in the privatisation process in the late Soviet Union. Savvidis also became heavily involved in Russian politics; in 2003 and again in 2007 he was voted into the Russian Duma as a member of Putin’s party United Russia. As a result, Savvidis’ economic activities in Greece were often understood as a political move by Russia to gain more influence over single member states of the European Union. At the same time, PAOK seems to be more than just politics for Savvidis. In May 2017 Ivan Savvidis took over the port of Thessaloniki, which made him the counterweight of Olympiacos owner Marinakis. In fact, the Russian oligarch went to war with the football establishment. In 2016 he removed PAOK from the Greek Cup citing security concerns. Back in 2016 Greek football was facing suspension from FIFA for suspending the cup competition and under pressure re-instated the cup. Savvidis has always fought for wide sweeping reforms not just in football but also in politics and economics. PAOK, therefore, has almost become like a catalyst, an obsession, to be used by Savvidis to fight the establishment in Greek football and beyond. That conviction was taken to the next level when he was seen storming onto the pitch last weekend with a gun strapped to his belt after the referee overturned his decision to give a goal. AEK players later accused Savvidis to have influenced the referee, and indeed there are pictures with his hand on the gun in proximity to the referee. Needless, to say when the referee overturned his decision after over an hour and wanted to restart the match AEK players refused to continue the game. What will happen to Greek football? FIFA and UEFA despise political influence and are not shy of banning football federation from international play. Hence, the decision by Deputy Sports Minister Giorgos Vassiliadis to suspend the league “until there will be peace and new rules”, could be seen as politics interfering with sports, which in most cases leads to FIFA suspension. The government seems to be willing to accept a suspension to clean up the sport. “The government has been fighting for three years to clean up football; a lot of ground has been gained, but there is still much more to do. On no account will we allow this entire effort to be jeopardised or the phenomena of the past to be resurrected; we will not permit any turning back,” Vasiliadis stressed when speaking to the media on Monday. Suspension of the competition would be a sad end to a league that for the first time in years promised to end the status quo. Both PAOK and AEK were ahead of Olympiacos making it likely that after seven years Greece would see a new title holder. But with the future in doubt, there might not be any title holder at all this year. 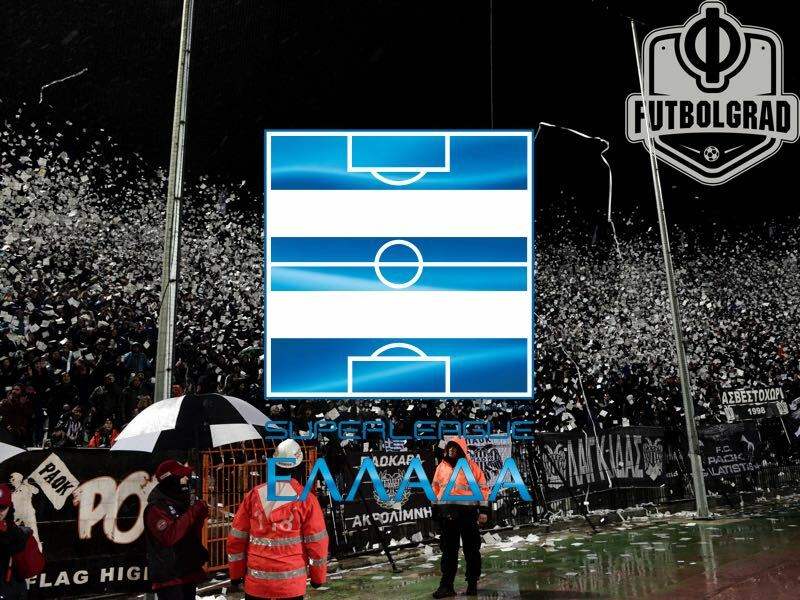 Perhaps reform and restructuring would change the status quo in Greek football long-term. Given the influence of business people and media stations, it seems likely, however, that the status quo is maintained even if the league should be stopped for some time. After all, Greece is dependent on its oligarchy in tough economic times and that very oligarchy controls the country’s most favourite game. AEK Athens fans wouldn’t go near the ground? You are supposed to be journalists. There is a ban on away fans travelling in Greece. Believe me AEK Athens fans would have no problem going to away to PAOK as they have been doing for decades. I realise you are just quoting someone else but stop trying to dramatise the matter further by using comments that are not routed in the truth.